Talk about a cast of characters. Marisa Wegrzyn’s play “The Butcher of Baraboo,” in its professional world premiere run at A Red Orchid Theatre, packs five colorful personalities – meaning all slightly skewed – into a petri dish of a space. Truth is, from my up-close-and-personal vantage point, the wacky lineup held more charm than the sum of this dark comedy. Wilmette native Marisa Wegrzyn, 31, won the 2009 Wendy Wasserstein Prize – awarded to a female playwright under the age of 32 who has not yet gained national attention – for her play “Hickorydickory.” She saw “The Butcher of Baraboo” staged as part of Steppenwolf Theatre’s First Look Rep in 2006. Wegrzyn has a wicked sense of humor and a flair for bright dialogue and edgy characterization. It’s easy to imagine this often glittering, if sardonic, opus honed to a sharp edge indeed. Baraboo, it’s vital to understand, lies roughly dead center in the state of Wisconsin. It is perhaps most famous as the home of the Baraboo Circus World Museum, which has no bearing on Wegrzyn’s play except that her characters could be escapees from it. I exaggerate, but only slightly. These are village Wisconsinites whose world view reaches more or less to the front gate. They speak with a distinctive accent, a clipped, semi-swallowed argot I know well from 20 years spent in Wisconsin during a previous iteration of my life. And this cast has it down in assorted credible variations. The butcher in question is an imposing middle-aged lady called Valerie (call her Val at your own risk) whose husband has been missing for a year. Her modest kitchen is notable for a butcher block and assorted cutlery, including a cleaver that she neither hangs nor racks but keeps handily driven into the surface of the block, hatchet-like. 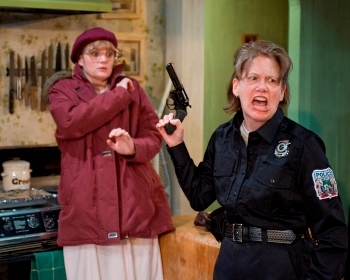 Kirsten Fitzgerald’s dryly direct Valerie rules her kitchen and nudges this play toward a glimmer of purpose. Valerie’s petite 30-year-old daughter Midge still lives with her, dresses wretchedly, has a testy relationship with her mother and works at a pharmacy, which she regards as an awesome resource for sundry drugs (which she sometimes peddles to the local middle-school kids). Missi Davis’ earthy, clever, inquiring Midge also leads one to believe this is all going somewhere. Valerie’s sister-in-law, Gail, is a cop in the unkind expression of mid-life. She’s a weathered, flinty, no-nonsense guardian of the public weal, generally suspicious and perhaps not quite the paragon of upright behavior that first meets the eye. You may recall Frances McDormand’s small town Minnesota police chief in the film “Fargo.” That’s pistol-packing Gail, with a loopy twist. Of Natalie West’s over-the-top cop, I can only say it doesn’t matter that the plot gets lost in the soup: She’s just great fun to watch. And that goes as well for Lara Phillips’ golden-hearted Sevenly (yes, yes, the seventh child in her family out in Provo), wife of Valerie’s brother-in-law. Sevenly’s specialty is super-rich brownies; that and reproduction. She and hubby have six children with a seventhly on the way. Note: That last bit is key; it spawns instant rapport between mousy Sevenly and pharmaceutical Midge. Last and, well, least is Sevenly’s sperm supplier, Donal, brother of Valerie’s mysteriously departed spouse. Getting back to “Fargo,” you may also recall William H. Macy’s bungling, waffling, feckless husband. That’s Donal, straight up. He’s a deeply unattractive character, so all praise to H.B. Ward for making him so palpably annoying. To this sparkling pentagram must be added designer Grant Sabin’s homey set (loved the avocado fridge), Linda Laake’s props (I was torn between the empty gallon milk container and the full gallon jug of blood) and director Shade Murray’s intensely physical take on the play’s bleak humor. But now something really must be said about the upshot of all these interactions, the tunnel of dramatic passage, the arc and landing place of “The Butcher of Baraboo.” It is murky. It’s a whodunit in which we’re not sure if anything was done. Hello! Did something untoward happen here? A few family secrets also are implied but never quite clearly defined, and certainly not resolved. The main one involves spermy Donal. It does seem that by the final curtain we should have some straight answers. I might have settled for some plain questions.